One year ago when Parvathi Sreekumar earned her PhD in Crop Physiology at the University of Agricultural Sciences in Bangalore, India, she never would have guessed that today she’d be halfway around the world, learning computational biology and bioinformatics to study bacteria in Philippe Cluzel’s lab. Yet here she is in Cambridge, along with three other research fellows from Bangalore who were awarded the inaugural Boston Bangalore Biosciences Beginnings (B4) Fellowship, co-sponsored by the South Asia Institute (SAI) at Harvard University and the Institute for Bioinformatics and Applied Biotechnology (IBAB) in Bangalore. 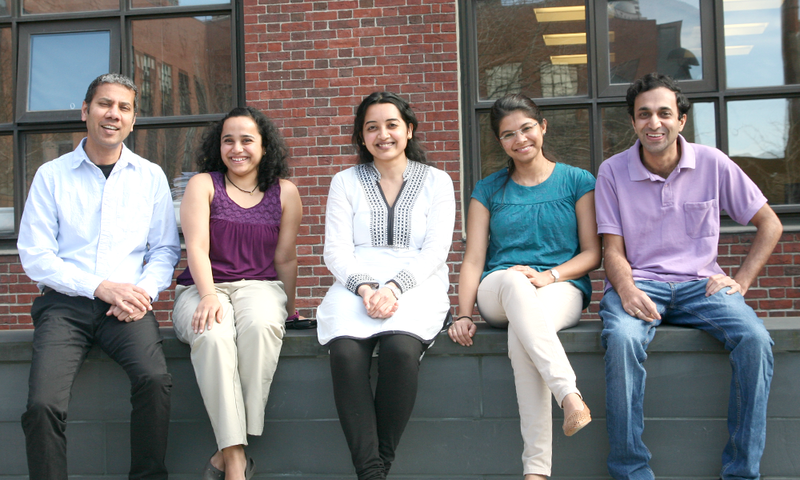 The four fellows, selected from over 52 applicants, earned their PhDs in different fields from different institutes in India, but all now share the unique experience of spending 11 months pursuing research in a completely new direction at Harvard. “Being part of this fellowship is broadening my research exposure and equipping me with new skills that I can go home and implement in India. I’m grateful that students from diverse fields are being given an opportunity like this,” says Sreekumar. The B4 Fellowship complements the B4 Young Scientist Development Course, which took place in Bangalore in January, 2017. Read about that program here. The B4 program is supported by the Government of India’s Department of Biotechnology and the Government of Karnataka’s Department of Information Technology & Biotechnology and Science and Technology.